Bootstrap Business: Why And How To Build Ecommerce Progressive Web App Using React? Why And How To Build Ecommerce Progressive Web App Using React? Progressive Web Apps (PWA) has become popular by bringing together the best of web and mobile apps. While native mobile app development has become tremendously popular thanks to an array of device-specific features like Notifications off-line working transitions and animations. Progressive maps besides bringing all these customer-centric device features into the context of user experience also deliver web-centric features that help to get search ranks. Progressive web apps can particularly play an important role in the e-commerce shopping experience. As e-commerce shopping is increasingly becoming customer centric and personalised native features coupled up with fast-paced women experience can provide a more significant boost to business conversion. Both react native, and ReactJS have emerged as two of the most suitable technologies to shape progressive web apps. But before discussing the effectiveness of React for building e-commerce progressive apps we must define what Progressive Way maps are. 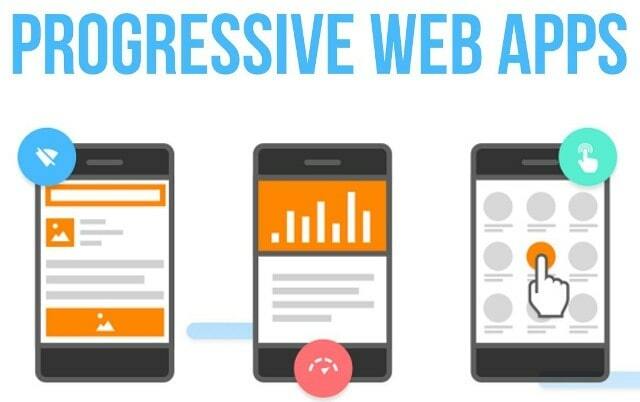 Progressive web apps can be defined as websites native app-like look and feel or it can also be defined as the mobile apps with the web-like interface. Within the app-like shell progressive web apps offers the capabilities off browser-based websites. By functioning much like the native apps, PWAs offer a lot of benefits we normally associate with native mobile apps. All the while it never undermines the capabilities off website experience. Progressive web apps provide all the benefits that modern browsers are capable of including easy accessibility and search engine indexing. Let us have a look at the key advantages of Progressive Web Apps. • PWA relies on a progressive enhancement to ensure faster loading speed for web apps. • PWA offers navigation and user interaction much like the native mobile apps. • It relies less on the network connectivity while making web contents available for the users. • By using HTTPS, it prevents snooping and all kinds of tampering efforts. • Users can access the web service without requiring to download any app from App Stores. Why Use A PWA For E-commerce? Progressive web apps brought a paradigm shift to the world of web, and mobile app user experience and this huge shift are particularly visible in the context of ecommerce stores. Let us explain here some reasons why PWAs can play an important role in ecommerce stores. There are many online stores that are offering a lite PWA version to help shoppers access the service with a fast-paced native interface. Flipkart Lite can be cited as an excellent example of this. Let us have a look at the key benefits of PWA in the context of ecommerce. • Since browsing a simple website is common to all devices without the constraints of platforms, PWAs are great. It offers a native app-like experience even when the customers access the store through browsers. • PWAs, thanks to wider access and penetration as well as fast loading pace, help to boost traffic footfall and conversion rate.  Pre-caching of PWAs helps to offer a really fast and smooth shopping experience. • As PWA brings together both web and mobile app into one, it actually brings down the development budget for an ecommerce venture. • There are a lot of big ecommerce brands who already garnered success by implementing PWA. Some of these names include Flipkart, AliExpress, Konga Selio and many others. Some of the key benefits of React include the following. All these benefits make React an ideal technology to build PWA ecommerce apps. • React allows reusing the same code to build multiple apps and this helps faster development. • Lightweight and minimal coding of React helps to keep the app lite and fast-paced. • React by allowing offline caching helps smooth and faster browsing irrespective of the network condition. • By providing all standardised APIs it delivers cross-browser development capability. • Thanks to component-based and modular approach React allows developing and testing each component separately. • React ensures faster server response time by pre-rendering an app. How To Create React PWA App? Consider These Simple Steps. Now let us mention here how you can build a progressive web app using React. Let's mention the steps. First setup the required API and then begin building the basic React JS app that by default offers support for PWA. Before starting with the create-react-app package install NodeJS and NPM globally. Now that you are going to build a new PWA app using React keep the following things in mind. • Organise and structure the files of the app based on best practices. You can choose a folders-by-feature structure to ensure optimum scalability. • Maintaining a coding standard is a must for staying clear of unused dependencies. This practice also helps with respect to validating all data right at the component level. • Keep all your components as small as possible to ensure a lean and lightweight size to provide faster performance for each of them. You have several libraries that work well with React such as bootstrap, material UI, semantic UI and several others. Building a PWA for your ecommerce Store has an array of advantages and React comes just as the ideal technology solution for this. It is advisable to opt for an experienced team of developers with commendable React and PWA development experience to their credit. About The Author: Juned Ghanchi is co-founder and chief marketing officer at IndianAppDevelopers, professional company to hire mobile app developers in India. Juned is always looking for new ideas about software development and share it on various reputed technology blogs. I hope you enjoyed this blog post about why and how to build ecommerce website progressive web apps using React.